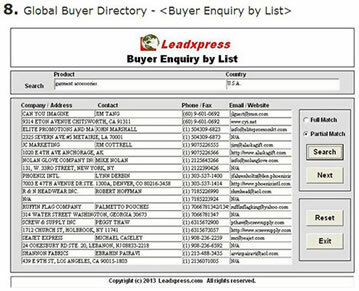 On the (Buyer Enquiry by List ) screen, you may use Country and/or Product name to search buyers or importers. The result will return buyer's company name, address, contact person, phone no, fax no, email address, and website address, etc. and is display on screen in the table form. It supports (Full Match) or (Partial Match) of the searching criteria. 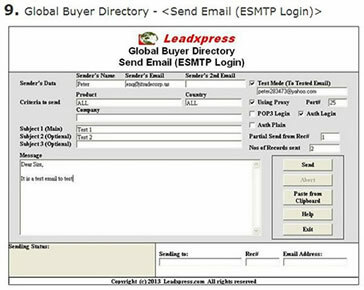 This option supports standard ESMTP (Enhanced SMTP) email server's POP3 and AUTH Login, sending tested email to user designed email account, setting multiple subject lines, partial email sending, pause 5-20 seconds and resume during sending process, personalization by mail-merge of the contact person, and setting an auto-generating random code as the Email ID or mail reference. On this screen, you may send a single email or group emails according to different sending criteria such as company, product and/or country. You may directly type your email message on the "Message" field, or create your message by word processing program or text editor such as Wordpad or Ms Word and then copy the content onto the "Message" field by using (Paste from Clipboard) function. Besides, you may send a tested email to your designated email account for testing when your check (Test Mode).